One of the duties of the principal is to appoint a five-member faculty council. The principal can assign this responsibility to the chapter adviser; however, the principal ultimately should approve all faculty council members before their first meeting. Who Can Be on Faculty Council? Faculty council members should be from the school’s professional staff and not support personnel, such as administrative or custodial staff. 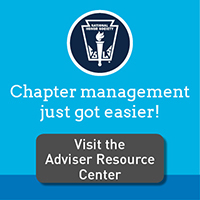 The chapter adviser serves as a sixth nonvoting member of the council, facilitating all meetings. The National Constitution does not allow principals or assistant principals to be members of this five-member council. This is done to ensure impartiality should a matter require a principal’s action, such as an appeal by a nonselected student or a discipline or dismissal action. The faculty council works with the adviser to develop and periodically review local selection procedures and disciplinary procedures. In selecting members for a chapter’s faculty council, principals should remember that these individuals are working on behalf of, and are representative of, the entire school faculty. Faculty council members will need to be fully knowledgeable of and carefully follow all chapter guidelines and procedures.